Commercial grade 1 1/4" thick Granite Table Tops with a 3/4" plywood core, complete with epoxy and fiberglass backing. 1-1/4" Table Top thickness, easy to install and lighter weight for portability. The standard bullnose edge provides a finished appearance and safe rounded corners. 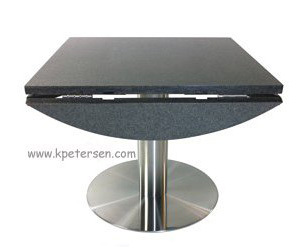 Polished granite table tops are scratch, stain, heat resistant and sanitary. 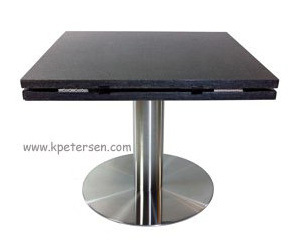 Plywood core granite restaurant table tops are heavy but less heavy than comparable size tops made of solid granite ( about three quarters of the weight ). The weight comparison between solid wood table tops and plywood core granite restaurant tables makes the granite viable almost anywhere. For example, a 36" X 36" X 1 3/4" thick solid oak table top weighs around 70 lbs. A plywood core granite table top would weigh around 90 lbs. The actual task of moving these two types of table tops around would be very much the same. Same for the cost. 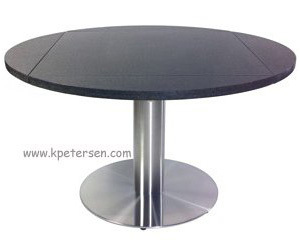 Plywood core granite restaurant tables will generally cost less than domestically made oak or maple restaurant tops. Granite restaurant tables cost less to ship too...Low cost shipping because granite tops travel at a much better freight classification than wood. And these ship from stock! No waiting for weeks to get your order. 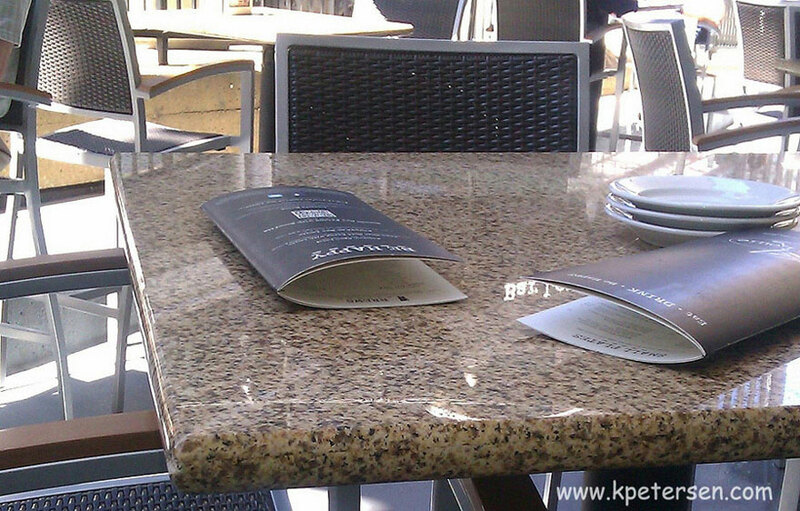 Granite restauant table tops tops are scratch, stain and heat resistant. The sanitary table surface is perfect for restaurant use. Granite table tops can be used outdoors or indoors and look beautiful and are easy to maintain in either environment. For Restaurants, Hotels, Coffee Shops, Deli's, Food Courts, Lounges, Country Club. 36" Square To 51" Round Dropleaf Graniet Restaurant Tables Now Available.